Petra Mountain Retreat and Conference Centre is a Christian resort nestled on the ridge of Legogote Mountain in the scenic Mpumalanga Lowveld. Petra�s unique position, tranquil setting and spectacular views make it the ideal place to relax in nature and for bird-watching. 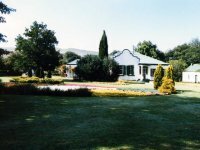 The facility overlooks the Peebles Valley where Sir Percy Fitzpatrick wrote the well-known book Jock of the Bushveld. Although primarily a Christian retreat and conference centre, it also provides an ideal stop over for the many tourists who visit our beautiful part of God�s creation, and is a short 15 minute drive from the Numbi Gate of the Kruger National Park. Petra Mountain Retreat & Conference Centre offers 14 spacious double en-suite bedrooms with very comfortable beds and tea/coffee making facilities. All the bedrooms are non-smoking rooms. For those with young children, there are two adjoining bedrooms with an inter-leading door allowing the privacy of your own room with peace of mind for your children. The wild horses are frequently seen in the sleepy village and if you take a hike to the edge of the escarpment you are sure to see them running on the plains. If what you need is to catch your breath and feel alive, then Fannys is the place to be. 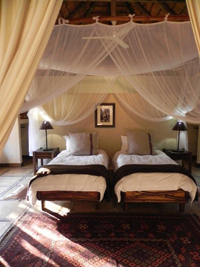 Luxurious self-catering accommodation. Three bed, three bath, sleeps 6. Open plan kitchen with all the modern amenities to make your stay comfortable. There is a washing machine, dryer, microwave, stove and much more. DSTV facilities just bring your own smart-card. The main bedroom has its own balcony with a breath taking view. There is also a sky-light which has clear glass to allow for star-gazing on those clear starry nights. You may even see a shooting star to make a wish upon. THE REST COUNTRY LODGE is a magnificent and architectural inspired residence set in a 40 ha estate with indigenous bush, abundant birdlife and spectacular views of the surrounding countryside and mountain. Excellent quality spacious bedrooms are individually designed with sundecks, maximum privacy and have satelite TV, telephone, music center and mini bar. Enjoy friendly personal service, generous breakfasts and dinner by prior arrangement. Very peaceful environment, pool on verandah deck, nature walks and rewarding birding. Explore the Kruger Park, Blyde River Canyon, Kaapsehoop Mountains, the Lowveld Botanical Gardens, Nelspruit Nature Reserve and other local attractions. KOMATI GORGE LODGE - The pristine beauty, peaceful and crime free environment offers the visitor a relaxed holiday guaranteed to rejuvenate even the most stressed-out individual. Over 12 kms of the Komati River winds its way through the gorge, and the property of over 1100 ha boasts beautiful cliffs, krantzes, rolling hills and bushveld. This biodiversity creates a perfect environment for the prolific bird life and other naturally occurring fauna and flora. There is also some game on the property. The Lodge, situated in a miniature Grand Canyon, has 4 stars and offers affordable luxury accommodation in 4 double suites, three self-catering cottages and 6 romantic self catering units for 2. All rooms have satellite TV and a fridge and private veranda with lovely views of the gorge. 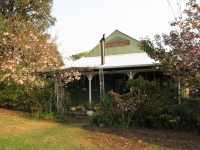 The cosy pub and restaurant offers a good selection of South Africa's favourite foods and wines. Activities include, fly fishing in the river and 3 stunning dams, guided quad bike tours, hiking and walking, bird watching and exploring ancient ruins. Game viewing on horse back close by. Moholoholo nestles on the slopes of the 1,944 metres high Mariepskop, one of the highest peaks of the Drakensberg range in this area. This affords a breathtaking view of the towering mountains and vertical cliffs on one side and the rolling Eastern Transvaal Lowveld savanna towards Kruger Park on the other. Visitors to Moholoholo can experience both Lowveld woodland as well as indigenous mountainous rain forest without leaving the Game Farm. 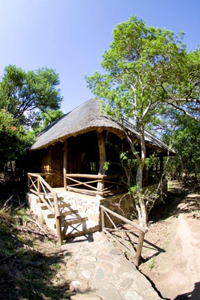 The Forest Camp comprises of 10 secluded chalets each with an en suite.The main building is where the dining room and deck are situated. The deck overlooks a small shady waterhole under a canopy of large trees where Nyala and Bushbuck come to quench their thirst together with Samango monkeys under the watchful eyes of birds such as Green Twin spots, Paradise Fly Catchers and Pygmy Kingfishers. The waterhole is floodlit at night and visited by nocturnal animals such as Bushpig, Civet and Porcupine. Our host and hostess�s sincere hospitality makes any visitor feel at home and �part of the family� within minutes after arriving. The lovely setting of the camp soon soothes away stress while the peace and quiet of unspoiled nature becomes a way of life. Country-style cooking enhances the intimate atmosphere experienced at Forest Camp. During the day, game and bird viewing can be done on foot, as a number of easy walking trails are available. The hide at the main waterhole is one of the popular places to relax in the tranquility of the bush. At night guests are taken on a game drive in an open vehicle. A late afternoon drive can be arranged if it is available at the time. Wildlife includes Waterbuck, Kudu, Eland, Blue Wildebeest, Zebra, Nyala, Bushbuck, Giraffe, Warthog, Bushpig, Leopard, Civet, Serval, Caracal, and many others. The prolific bird life makes Moholoholo a bird watchers paradise. A visit to the Moholoholo Wildlife Rehabilitation Centre is an unforgettable experience. A wide variety of birds and animals can be seen here, where Brian Jones and his team nurses and nurtures the injured and orphaned, rehabilitating them for release back to the wild. Guided tours through the Centre brings visitors in close contact with the rare and common species such as the lovely Crowned and Martial Eagles, Owls, Vultures and a variety of raptors, Serval, Duiker, Lions, Leopard, Wild Dog Hyena and many other animals and birds.